The goods are put by packs, each pack covered with polyethylene. 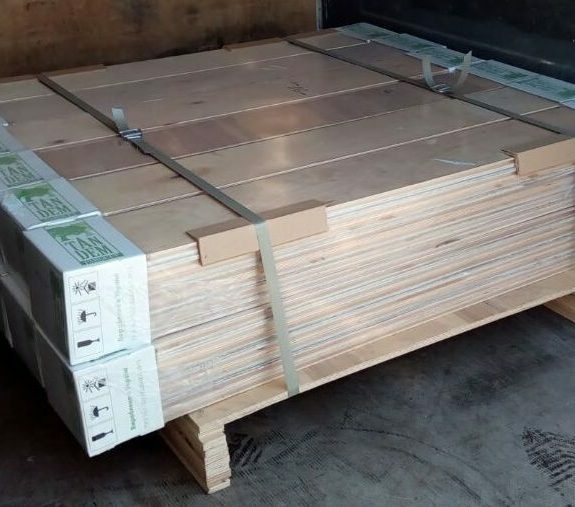 One pack consists of 4 boards for 1800/2100/2400/2700/2850/3000 mm lengths and 7 boards for 900/1050/1200/1350/1500 mm lengths. Each pack may contain one piece which consists from two or three parts with total length equal to the length of one normal piece. In this case total square of goods in pack is not changed. Some boards may be shorter than their nominal lengths, but not more than 50mm. Quantity of such boards is not more than 5% of their total quantity. The top board of each pack is put plywood side up. The packages are packed on the pallets. Full pallet is tightened with polypropylene belt using plastic corners on upper edges. We care about the environment!